Beach Village: Perfect for backpackers! Here at Beach Village we know exactly what backpackers want. Whether you're travelling solo or with a group of friends from home, you can be sure to meet some great new lifelong friends thanks to our super social backpacker vibe. With acommodation to cater for any budget and regular parties we guarantee your stay will be unforgettable! 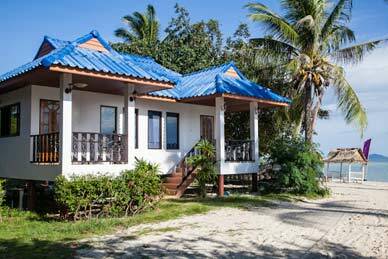 From budget backpacker acommodation to full on flashpacker beachside bungalows we have something for everyone! You choose your budget and we'll have a place for you to stay. Party animal? Then choose the party dorm! What better to get you in the full party mood with one of The Beach Villages warm up sessions? We have international DJs spinning from the early afternoon all the way through until the end of the day when the big parties start. The day after full moon we have live music playing in the evening on the beach to truly wind down. Turn right past the 7/11 and continue to walking street. Keep going down walking street as this street turns into the main Baan Tai Road. Go straight for 5 minutes (20 minute walk). Turn right onto a gravel road when you see our signs, we are located sea side across from the Yamaha shop. Follow the gravel road towards the sea straight to the end. Take the road out of Haad Rin which joins Baan Tai Road and follow it straight for about 10 minutes. Turn left onto the gravel road when you see our signs, we are located sea side across from the Yamaha shop. Follow the gravel road towards the sea straight to the end.